Trend Title:Christopher Robin; No Matter What Pooh's Back! Info:Nostalgia Brings Warmth Just Hearing Pooh Again. He’s back! Winnie is back and who doesn’t want to see him again joined by his buddies! See Christpher Robin to see Winnie! If you like Winnie the Pooh, this is for you. Get ready because the opening will make you tear right off the bat. Sentimental and loving. Lessons of joy and being open. This one blends fantasy and reality with warmth and heart. A live-action version that revists the old fairy tale that is a breath of fresh air - if nothing else, for its innocence. This one does that. Be ready to be transported to Winnie the Pooh and his best friend Christopher Robin played by Ewan McGregor. The action adventure comedy from Walt Disney Pictures, directed by Marc Forster and written by Alex Ross Perry, Oscar winner Tom McCarthy, and Hidden Figures Allison Schroeder, is a story of innocence and appreciation for what we have, that makes us think while keeping us warm inside. The pacing of the movie was off at times but overall the message is sweet and it’s a great family film. Pooh and clan have been part of the Disney family for over 50 years since 1977. This is a cushy, sentimental and heartwarming tale of Disney’s Robin who ventured out with his lovable stuffed animals but now is all grown up and his old buddies enter to remind him of who he once was and are there to help bring out his inner child once again - all along showing who he still is. Pooh is there to show Christopher that he has lost sight of what is important in life. 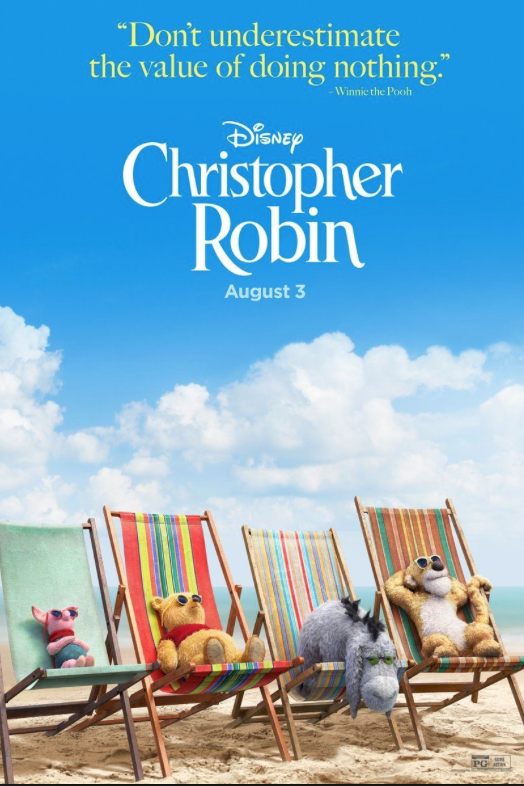 Inspired by the real story of Winnie the Pooh author A.A. Milne and his tough relationship with his son Christopher Robin, this live-acton/CGI talk is about grown up Christopher who is a workaholic that doesn’t pay enough attention to his wife and child and has lost his sense of joy and imagination. One day, out of nowhere, his old pal Winnie (voiced by Jim Cummings, who has voiced Winnie since 1989) shows up on a park bench and wants to work with Christopher to find their old friends. Pooh recognizes him (even though he’s grown now) after not seeing him for some 30 years ago. The voicing work is excellent but the design is off a bit. Seeing Pooh and pals as computer-animaion CGI does not compare to hand-drawn animation which is much more alive where the colors pop but in this one, the colors are muted somewhat. The animals just don't have vibrancy and their eyes are vacant compared to the movies before this. (Winnie and Eeyore's eyes particually bothered me.) I didn’t like the new look of Pooh's fur either which is off when you first see it, but the voicing is so strong that Pooh's sound makes it all better. Hearing Pooh’s voice just makes everything OK. As far as the action; it's solid in that they looked like stuffed animals that walk and talk and romp. Brad Garrett is the voice of the funny donkey Eeyore. Cummings also voices Tigger, Nick Mohammad voices Piglet, Toby James voices Owl, Sophie Okonedo does Kanga, Sara Sheen is Roo, and Peter Capaldi voices Rabbit. Note; Rated PG, for some action scenes.